The Fred Hall Shows will once again host the high-flying fun of the Dodge Dock Dogs. The excitement and crowd-drawing action of these captivating canines is coming to Long Beach Convention Center, March 7-11. 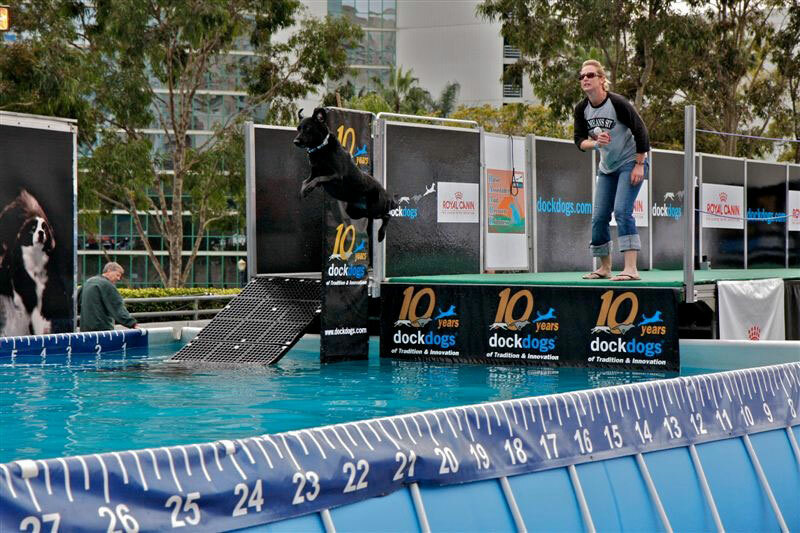 The Dodge Dock Dogs will showcase three unique events: Big Air, Speed Retrieve and Extreme Vertical competition. Big Air is essentially a long-jump contest for dogs. A dog may start anywhere on the 40-foot dock — and the dog runs and jumps into the water after a throw toy, thrown by the handler. The distance is electronically calculated from the end of the dock to where the tail set of the dog breaks the water’s surface. Speed Retrieve is the canine version of drag racing. Located at the end of the pool is a Dock Dogs Flappy toy, suspended 2 inches above the water with a starting light above it. The dog is then placed at the 20-foot white mark on the dock. When the light turns green, the handler releases the dog — and the time stops when the dog has grabbed the toy. Extreme Vertical is the crowd favorite: a high-jump for dogs. The dog starts off at the 20-foot mark on the dock and jumps up to grab a Flappy toy, extended out 8 feet from the end of the dock over the water. The starting height for Extreme Vertical is 4 feet, 6 inches — and it goes up in 2-inch increments. Teams competing in all three disciplines may choose to compete for the title of Dock Dogs Iron Dog. Teams earn points for their top score in each of the three disciplines — and the team with the most points at the end of the event is crowned as the top overall Iron Dog. Each dog handler and competing dog will receive one free admission to the show. Dodge, which is bringing the Dock Dogs back to the Fred Hall Show, will present a giant Dodge and Ram display inside the show — and will show more vehicles outside. The Fred Hall Long Beach Show is the first of two entertainment-filled Fred Hall shows in Southern California, and the Dodge Dock Dogs will be at both events — March 7-11 at the Long Beach Convention Center and March 22-25 at the Del Mar Fairgrounds. Whether you are an angler, a hunting enthusiast, a travel buff, a camper, a diver, a wakeboarder or a boating lover, you’ll find the Fred Hall Shows will have something for everyone.